Today for Flag Day the kids and I decided to visit the cemetery and place flags on all of the veteran's graves. The cemetery was closed but we trudged through the snow anyway. It was a beautiful, albeit cold (well Nova Scotia cold) afternoon, but it was worth it. As a general rule, we don't like being at the cemetery. Seeing Dan's name in granite is a harsh reminder of all that we have lost. But today was different. It wasn't about us, it was about them. 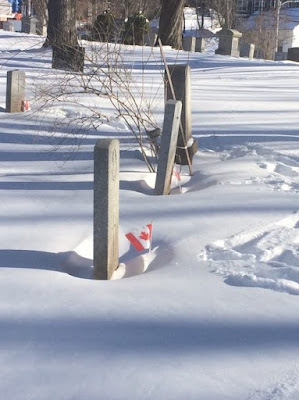 We placed flags on each of their graves and as we did, we paused and read their names. Arthur. George. Cecil. John. James. Neil. Ralph. Stanley. Gordon. Vernon. Dan. Husbands, fathers, sons, brothers, friends. These men (there are no female veterans buried here) devoted their lives to serving our country and to the flag we honour today. So how could we not honour them in return? It's our responsibility to make sure none of these brave men are ever forgotten. 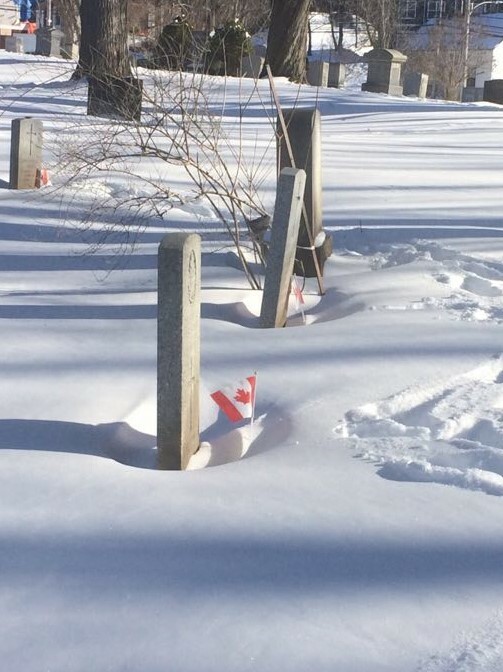 And, maybe, just maybe, others that visit the cemetery will see the red maple leaves and they too will stop and remember, and say their names out loud. Today my frozen tears were not of sadness but of gratitude. How lucky are we to live in a country with Arthurs and Roberts and Johns and Dans? We can never thank them enough for all they have done for us and our country. The least we can do is spend an hour with them on a cold winter's day. We owe them that much.